Take your psychic abilities in a new direction! 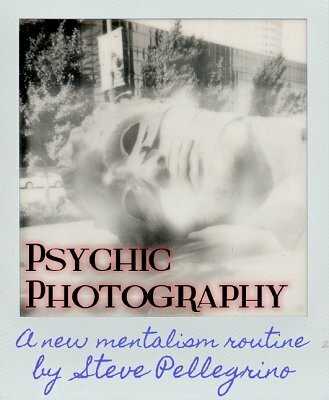 If you are looking to take your psychic abilities beyond metal bending and moving pens with your mind then you need to know about Psychic Photography . You show a Polaroid camera, which can be examined. A factory sealed pack of instant film is also shown. A spectator can open the pack of film and load the camera themselves. You take a photo of the spectator to show the camera is operational. You explain to the audience that you have an ability to concentrate on a location and cause an impression of that location to expose on film. The camera can be set down in full view or held by a spectator. The audience is invited to call out various landmarks, which could be local, national or international. As they're called out, you write them down and one at a time placed in a paper bag or envelope. A spectator is asked to remove one of the papers and reads what is written. You concentrate on the camera and after a few moments ask the spectator to push the button to take a photo. As they do that a photo pops out of the camera. A few seconds pass as the photo is allowed to develop. The photo is shown and it matches the selection. This is an amazing effect that your audiences will be stunned watching. The photo is completely customizable. The spectator can take it with them as a souvenir, along with the photo you took of them at the beginning of the performance. The camera is not gaffed. The photo you take of the spectator and the psychic photo come from the film pack that the spectator loads in the camera. You're not switching photos. Once you understand the principle you will find that you can take the presentation in different directions. It's an amazing revelation that lends itself to the effect as described or as part of a Remote Viewing demonstration as one example. Everything is described in detail and can be put together quickly and inexpensively. 1st edition 2015, 25 pages. Piddington's Secrets: We know How They Did It!